A large number of Fantasy Premier League managers in the top 10,000 have signed Sergio Aguero (£11.3m) for Double Gameweek 25. Ominously, a chunk of those high-level players have also activated their Triple Captain chips too. Manchester City striker Aguero has taken Pierre-Emerick Aubameyang‘s (£11.2m) place as the third most popular forward in the top echelon of the game. Going into Gameweek 24, the Arsenal man was in 31% of teams in the top 10k, with Raul Jiménez (£6.5m) and Marcus Rashford (£7.7m) the only two ahead of him, on 59% and 91% respectively. However, the allure of fixtures against Arsenal and Everton, although starts in both are not guaranteed, has persuaded 40% of the top 10k to ensure they have Aguero in their ranks. Leroy Sané (£9.7m) remains the most popular of the Double Gameweek players in the top 10k, sitting in 63% of squads, up from 48.7%. It looks as if Eden Hazard (£10.9m), who hauled against Huddersfield, was the fall-guy for those signing Sané, as his representation at the top level shrunk massively from 48.6% to 29.3% between Gameweeks 24 and 25. The City man is the most-captained player in the top 10k, with 38.82% of the managers at that level handing him the armband. Given the decision of many to replace Hazard, who scored twice against Huddersfield, with Sané, the pressure is now on the German to deliver in his two outings. Aguero is the second most-captained on 28.5%, with Richarlison (£6.8m) on 20% and Raheem Sterling (£11.3m) on 12.4%. 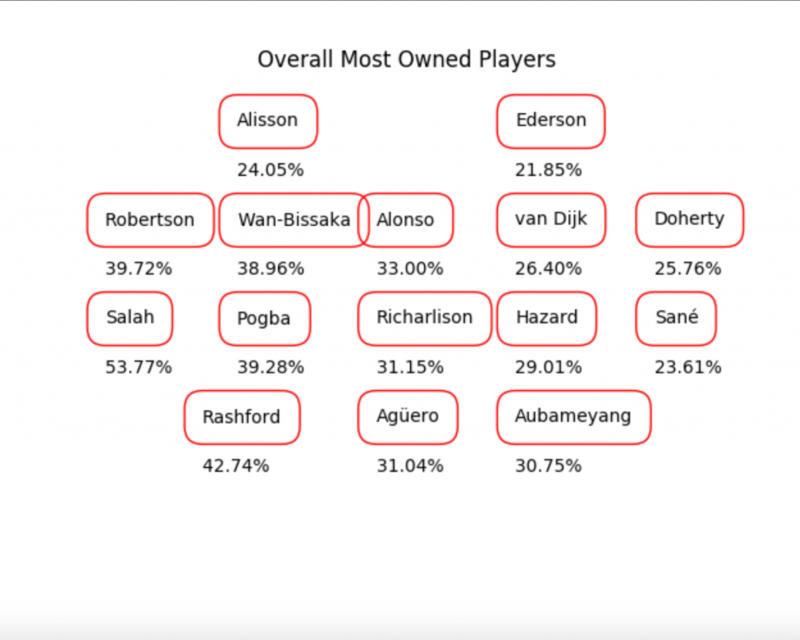 In total there are no more than four Double Gameweek assets in the squad of most popular players among the top 10,k – although only three of them are confirmed starters. The fourth is Lucas Digne (£5.3m) who missed Everton’s first fixture of the Double Gameweek on Saturday through suspension. The rest of FPL have taken a different approach to the Double Gameweek. Aguero is owned by a smaller contingent when all six million players are considered but remains in the top three most popular forwards. Sané and Richarlison are also present, but Digne is not. The most attractive defensive option for the Double Gameweek is Manchester City goalkeeper Ederson (£5.6m). Crucially, the Double Gameweeks has not quite swayed the masses as much as it has the elite level players. The most popular captain in overall in FPL this weekend is Mohamed Salah (£13.6m), with a 26.5% share. Aguero is second on 17.9%. Meanwhile, the Triple Captain chip has received some attention among the top 10k with Manchester City playing twice. The number of managers to have deployed that particular chip in or before Double Gameweek 25 jumped from 11.86% to 20.06%. That means 8.2% were brave enough to pull the trigger. There were also some Triple Captain chips played across the wider world of FPL, but not on the same scale. 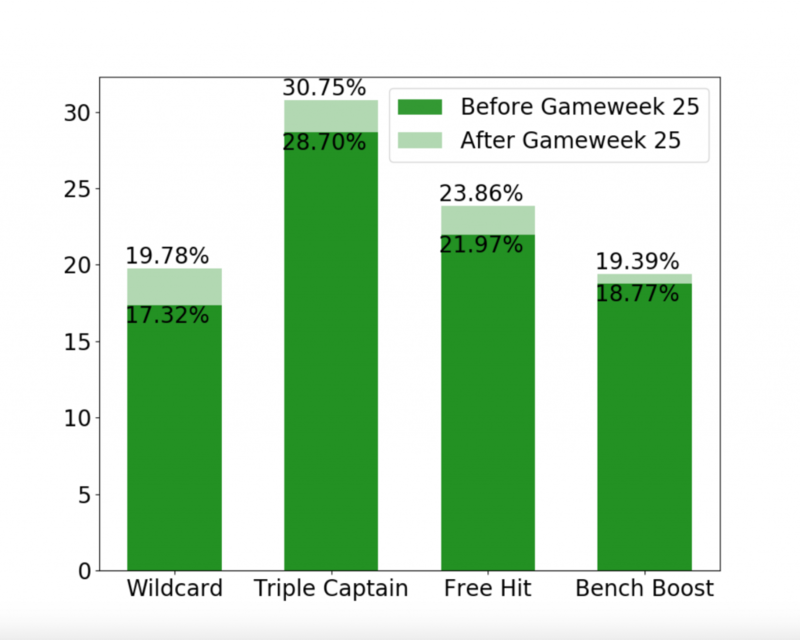 28.7% of managers overall had deployed the Triple Captain in the first 24 Gameweeks, that number increasing to 30.75% once Gameweek 25 was factored into the equation. Aguero looks to have the most heavily backed in the Triple Captaincy, earning 51,000+ augmented armbands. 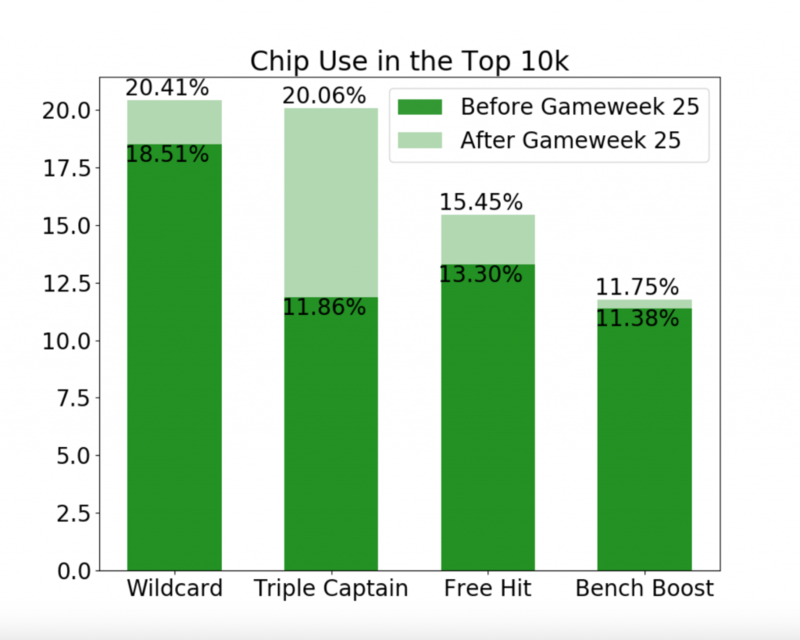 You will have also noticed that 2.15% of managers in the top 10k wielded their Free Hit chip this week too. Above, we can see that even in these Gameweek-specific squads, managers have not gone overboard on the Double Gameweeks. 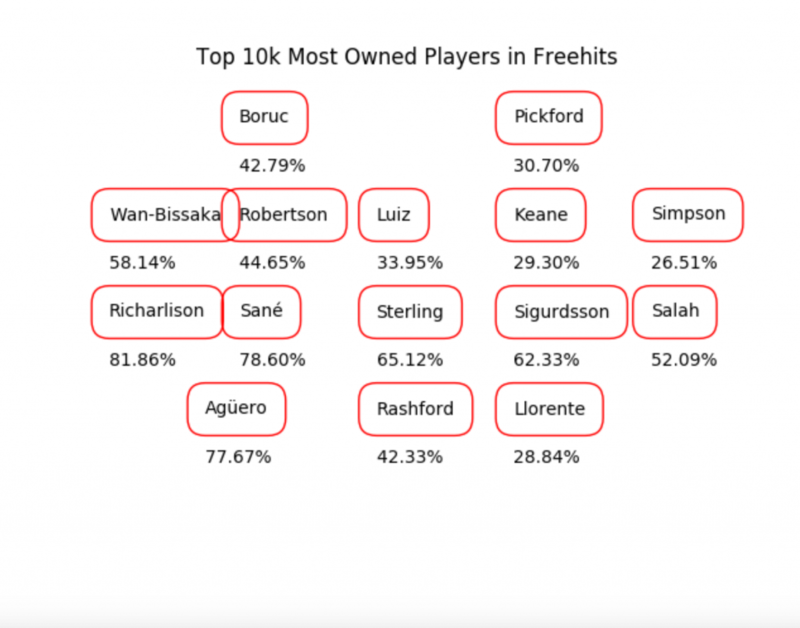 They are seven players in the Gameweek 25 Free Hit template, Aguero, Richarlison, Sané, Sterling, Gylfi Sigurdsson (£7.4m), Michael Keane (£4.9m) and Jordan Pickford (£5.0m). Arsenal have Huddersfield next week. But it is away and they don't like the cold. Hudd are woeful though. Arse should win by 2 goals. I'm considering Auba... And already own Kola. Hope they'll win by 0-2/0-3, sth like this, with involvement of these 2. Cant afford Auba, so Kola is my pick atm. Hopefully a CS and an assist will do. Good pick Kola, I want him too.....most likely for Danilo. So #3 in the world captaining Digne, that was a massive error right? Old smug pants going to get burnt on this. Yes, that was very strange indeed. Imagine if Digne doesn't play against Man City though! He will inadvertently get Salah (C). I really want to see the benchwankery punished, but there's no guarantee Digne plays. Could be either Baines or Kenny. End result aside, why do people do weird things like this? I don't get why it's fun or clever, it's just kinda pointless and stupid. At the very least if you're going to mess around that way, surely you quadruple check the fixtures / flags to be certain you won't ruin your season. Such a different mindset. It can be a bit of fun banter wide in ML's but agree you don't do it unless you've made 100% certain it works. That would do absolutely nothing for me. I couldn't care less about the banter. Just don't do stupid things, it's basically the key to FPL. Absolutely, that's why I want Digne to play. Do you know anyone who used his BB this GW? If yes, please send me his team. Cheers. I just watched yesterday's training session and haven't seen Aguero. Yeah, everyone but him. Ederson and Mendy were also there. He was there on 1st Feb (Friday) - so he would have to have picked up an injury yesterday to be out. Exactly. Perhaps he misses out today and returns against Everton. Presume Ederson will be in goal and was doing GK training away from the outfielders. The training video? The pictures are from Friday so not the latest. The twitter video is from Saturday so is up to date. Implication: Aguero was in line to start, picked up an injury, so now Jesus starts. We'll have to wait until 15.30 UK time to find out if this is true. Where did you get Aguero being injured from Diesel? Watch the twitter video. Every Man City player is in it apart from Aguero. That video was from the training session yesterday. If the pink bibs are the first 11, why did Philippe Sandler have one on yesterday? Photos are from 1st Feb - that is Friday and should be ignored. Only posted because Aguero was in them so he was in training on Friday. Twitter vid was from 2nd Feb - that is Saturday. Aguero was not in it - this implies he is out. As I said, IMPLIES, we won't know until 15.30 UK time. Twitter vid was from 2nd Feb - that is Saturday. Pink bibs wearers are Mendy, Stones, Laporte, Danilo, Delph, KDB, D.Silva, Sane, Sterling, Jesus. This implies they are the starters today. As I said, IMPLIES, we won't know until 15.30 UK time. Best way to beat Bournemouth is to give them possession. They are not incisive enough to score so if you nick it off them you can score against them on the counter attack. well, before the Chelsea win they lost every match against a top 6 side...fair to say that trend will continue against Liverpool, or you think they will also bring the fight to them? They will find it difficult away from home against VVD. Hopefully TAA and Gomez are back too. "Best way to beat Bournemouth is to give them possession. They are not incisive enough to score "
Didn't they just put four past Chelsea? In fact their 7th for goal scoring just behind the big clubs. Look at how they scored their goals - counter attack. They don't like playing against teams who give them (Bournemouth) loads of possession. How many points will I get from these blokes? Currently on 17 from 3 players. best cheap 5th mid these days? Got 10 points yesterday with Doh 5 points to be added from the bench. My rank fell from 9k to 19k. Sterling (C), Sane, Laporte, Pogba Rash, Rich, VVD ans Salah to go. Going Sterling (C) was ballsy coz he either plays full or 0 min. Let's see how it goes after a dismal Saturday. NB: Yesterday did rage transfers and brought in Jimi and Son for Mitro and Sterling. Hoping Sane comes out of the 2 games unscathed. Best wishes, I almost did that yesterday too but would have been INGS to JIMI. I will wait until after tonight's matches and then gamble on Sane not getting injured vs Everton.....funds are getting very tight! Thanks, I normally rarely do these early transfers, but thought I overlooked Jimi for far too long. Now I sit here after a considerable thought, that I should have gone Jota instead and get in Auba. Rage transfers are the worst but there you go. You wake up in the morning accepting results that happened the day before much easily. Live and learn, brotha, Live and learn. You only had 3 players play though ? Don’t understand rage transfers in such circumstances when most of your front line players could get injured ? I had Rich and Mitro. Having those 2 alone could change your mood. do you see these moves as enhancements? I'd keep Doh fo the rest of the season. Any other way to bring in Pereira (or Chilwell)? LEI has an incredible run of fixtures coming up. Lei sure do, something about them though, don't fully trust them. TAA is amazing when fit, which sadly isn't very often! Laca isn't scoring better than Barnes pts/$ is he? Question is which one to do this week? Laporte is obv not turning out to be a good FPL defender and he has tough fixtures coming up which could force my hand on getting him out ASAP. B. Are you planning to regularly play your 4.5 defender? How are you guys dealing with bgw31? I won't waste my tramsfers on BGW31 tbh. Just use the FH chip and then plan from there. Still too soon to commit to a plan. Sort of 1: bringing in players from all teams just with a bit of emphasis on those with confirmed fixtures. Son & Auba seem must haves for the next few games regardless. Wait for more info right b4 GW27 deadline, info = gold. OUT: Alonso, Haz, Sané, Kamara. IN: Pereira, Son, Fraser, Auba. Would be -8 but saves a -4 I'd be doing next week anyway. I can bench Pereira & Fraser through bad fixtures, and both have games in 31 & 33. C poll...Beleive many of us sit waiting for rest of gw games...Sane, Aguero, Sterling or Salah selected? Those brave enjoying picking Hazard well done! B's more sensible in terms of BGW planning, but Arsenal could still get both 31 and 33. 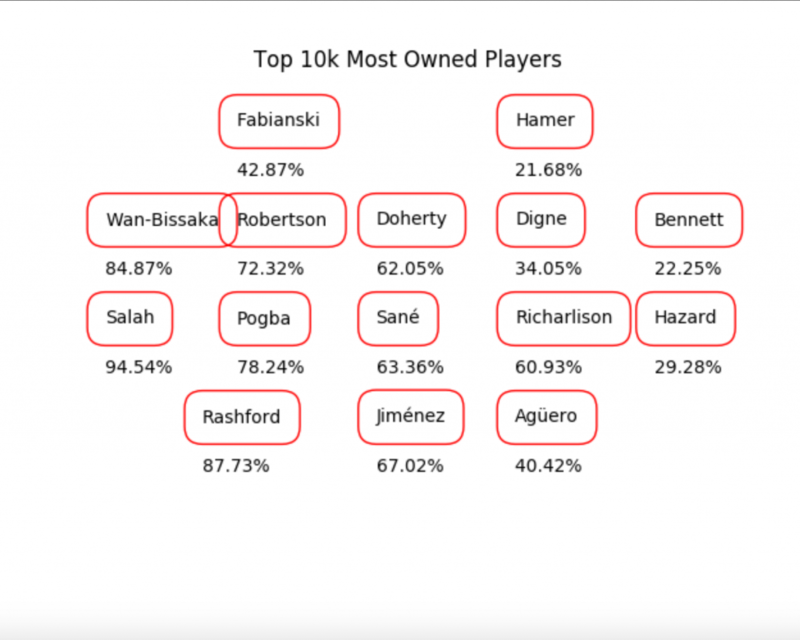 Hazard owners are you keeping or selling? City (a) and then a blank, makes sense to sell methinks! Twas a parting gift to the guys who stuck till the very end eh. Why do I have a "1" next to my name when I have been a member for 2 seasons? Can any mods assist with my query? Halloooooooo? I don't know for sure, but my understanding is members badge displays the number of full years you've had an account. Haha cheers for that RAE! Have you changed your email address or method of payment since you first signed up? Mine should be a 7 or 8 not 4. Coincided with a change in personal details/profile details. Cheers for your reply. That's a big discrepancy on your end.....hmmm I might have changed my credit card to renew my membership this season but that's about it! You signed up with your current email address in December 2017. That's just over 1 year, hence the 1. How did JWP play yesterday ? Good option ? Feel like everybody is flying this gameweek.. clean sheets galore and those with Hazard/Luiz are laughing. Here i am stuck on 16 from 3 and a big red arrow. effectively 13 to play though.. should I be worried? My City less team is going well (62 points) with my only DGW'er (Richarlison) being my only fail so far. I will still be hiding behind the sofa later this afternnon however. Are my chances of ending the GW with a green arrow still 50/50 ?